Who knew the most charismatic Buick was also the smallest one? Most people thought that Buick wouldn’t survive GM’s 2009 bankruptcy. Sales were in free fall and the average age of a Buick customer was pushing past 66 (one of the highest in the industry). What most people didn’t understand was how important Buick was (and is) to GM in China, where Buick is considered a prestigious, desirable, aspirational luxury brand. Buick is 110 years old this year. It was the first division of GM and for most of its life, it was considered the last stepping stone in GM’s divisional structure before graduating to Cadillac ownership. In 2009, Buick was spared not just because of China, but for GM to have a near-luxury brand to do battle with the likes of Lexus and Acura. Last year, when Buick announced that it would sell a Buick version of the Opel Mokka, most automotive insiders scratched their collective balding heads and wondered if this was the right move for Buick. Way back in 2012, aside from the full-size Enclave SUV, Buick’s lineup consisted of three sedans: Verano, Regal and LaCrosse. Each is separated by about 6” in length and they look so similar that most buyers couldn’t tell them apart. 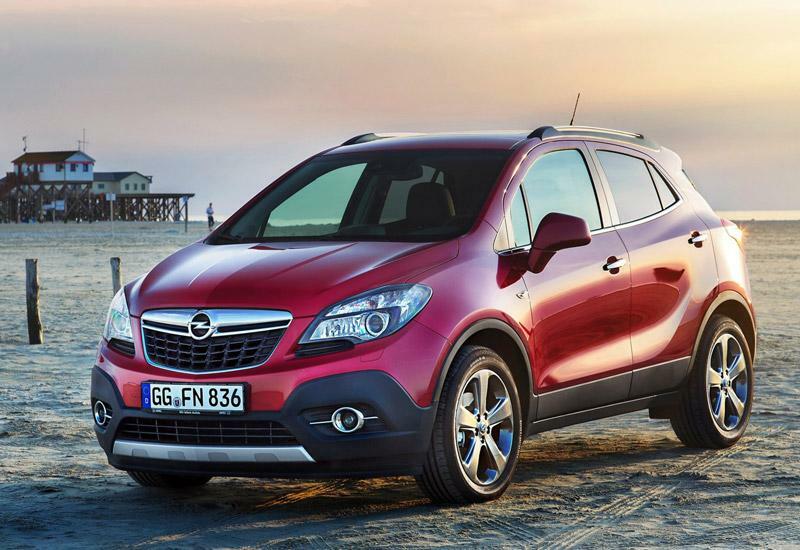 The Opel Mokka/Buick Encore is a subcompact crossover utility vehicle. 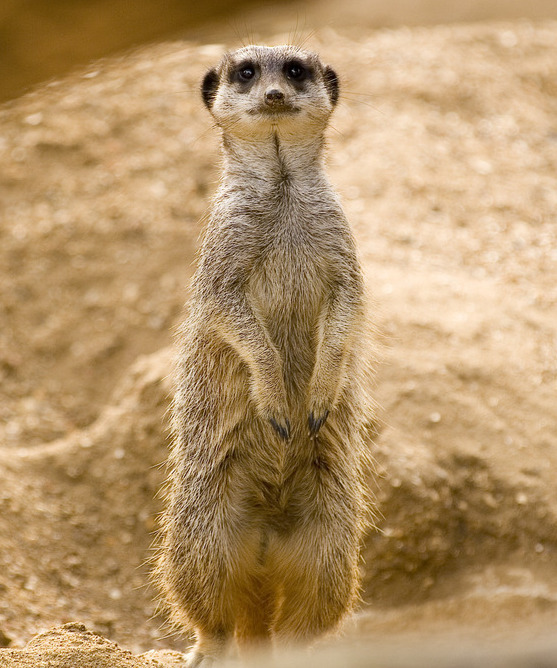 It’s about the size of a MINI Countryman, but it has a tall, upright look – kind of like an adorable Meerkat. It’s definitely the smallest car ever to wear a Buick badge. So how does this tiny ‘ute fit into Buick’s brand DNA? The size and youthful appeal is so not-Buick that at first blush, it seems like it should be in the Chevy portfolio. After all, Chevy’s smallest SUV, the Equinox, is far larger than the Encore. What it does have is premium materials like soft-touch plastics and leather seats, luxury car features like forward collision warning, a heated steering wheel and rain-sensing wipers and Buick’s calling card, a quiet interior. Standard on the Enclave is Buick’s QuietTuning™ which includes a laminated windshield, triple door seals and tight body panels. Also standard is Bose Active Noise Cancellation which uses the same technology in noise-cancelling headphones to eliminate that annoying road noise. 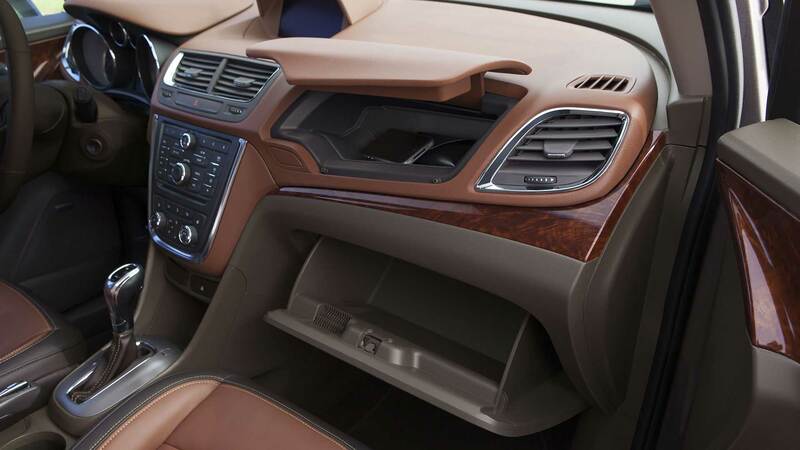 2014 Buick Encore Interior – Premium Trim level. But what I found most appealing was its personality and exclusivity. No other luxury or near-luxury brand has such a small offering. The closest comparison for price and size is the much noisier MINI Countryman. 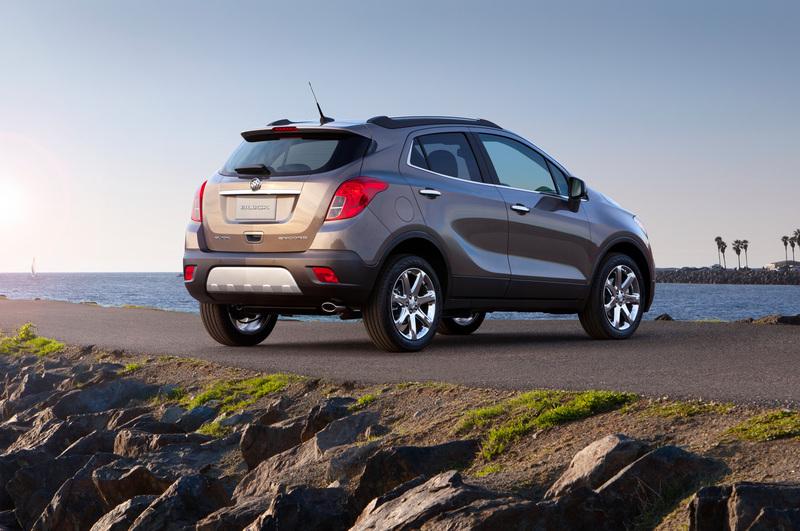 The Encore starts at $24,160 and a Premium trim model with AWD tops out at around $33,000. The Countryman starts at $22,100 but a Cooper S All4 tops out at more than $36,000 with a slew of high-end BMW options. The Buick waterfall grille is very bright. 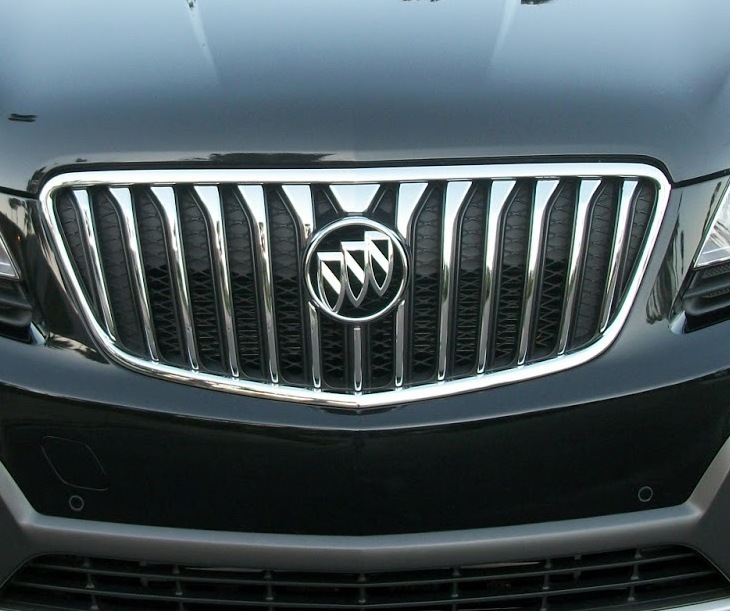 I like the new stylized tri-shield Buick badge. People can’t help smiling when they see the Encore. It seems almost silly coming from Buick. You sit in a commanding position behind a very stubby nose with Buick’s large signature waterfall grille and new, stylized tri-shield badge. Forward visibility is great and it’s fun to flog around in town. It’s easy to park too. The rear view camera (standard on upper trim levels) is a big plus as the rear window is tiny, limiting visibility. The extra visibility provided by the camera sure helps and it should be standard on all cars and trucks. 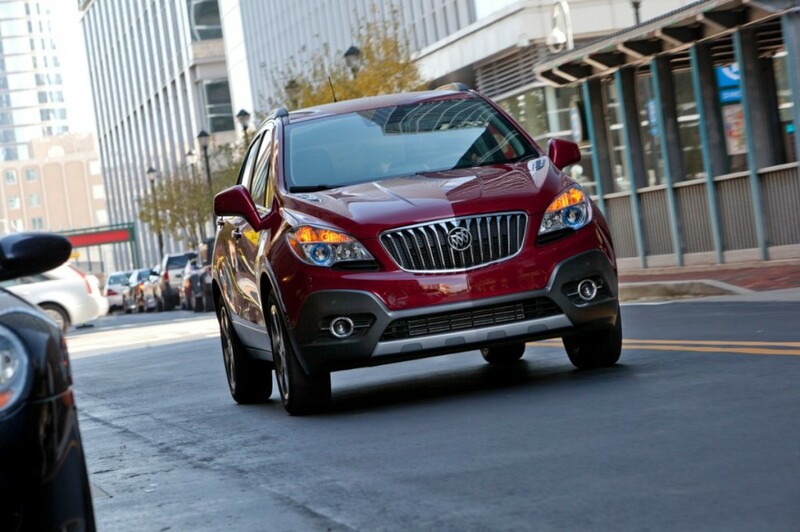 Blind Side Zone Alert and rear Cross-Traffic Alert are new safety options for 2014. 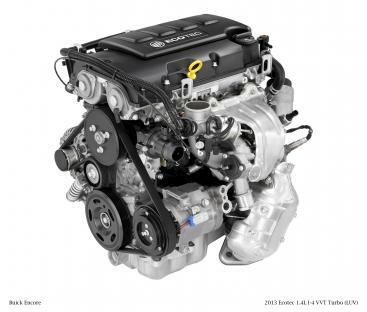 The little 1.4L Ecotec turbo 4 uses all its 138 hp and 148 lb-ft of torque to entertain. Around town, it feels like it has enough power and while it won’t win a sprinting contest on the highway, I didn’t feel it was severely lacking. I didn’t notice turbo-lag in normal driving and there was only a hint of it when you mash the gas pedal. The QuietTuning™ helps reduce noise inside the cabin. The double glove box is a nice touch. Great for small electronics. The standard 6-speed automatic works seamlessly to row the cogs. Like all modern transmissions, it loves taller gears to save gas, but I wasn’t annoyed by constant hunting. Drive Shift Control allows the driver to choose the gear – handy when using the engine as a brake doing down hills. The Encore is only slightly larger than the MINI Countryman, but it’s nearly 10” shorter than the Honda CR-V and 15” shorter than the Nissan Rogue. However, I think what matters to many buyers of “downsized” luxury is fuel economy. The front drive Encore is rated at 25 mpg city, 33 mpg highway; average 28 mpg – nearly identical to the Countryman competition. The AWD option knocks 2-3 mpg off those figures. It’s no secret that weight is the enemy of fuel efficiency. The MINI Countryman weighs in at 3,020 while the Encore tips the scales at 3,190 – a 170 pound difference. I’d opt for the the extra weight to escape the noisy interior of the MINI. 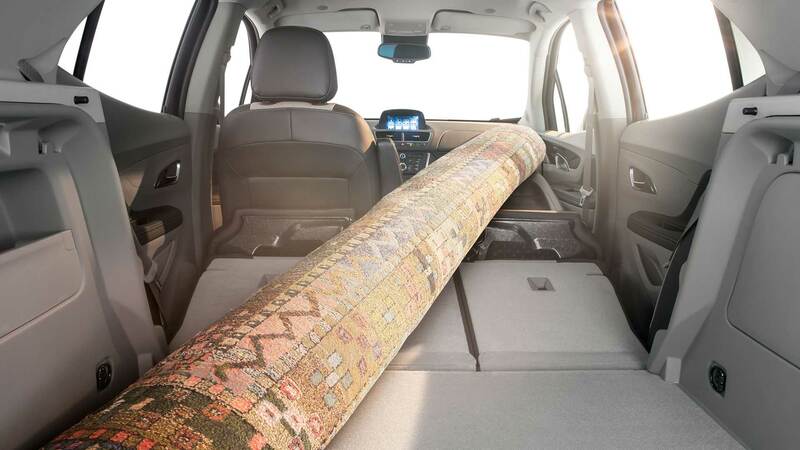 If you’re a big hauler of bulk items or regularly carry adults in the back seat, the Encore probably won’t fit your lifestyle. It’s best for 1-2 adults and maybe an infant. Total cargo capacity, with the rear seats folded is 48.4 cubic feet. That compares favorably to the Countryman which has only 42.4 cubic feet. But the decidedly more utilitarian Honda Fit, which is 7.4” shorter than the Encore, works magic to swallow 57.3 cubic feet of stuff. 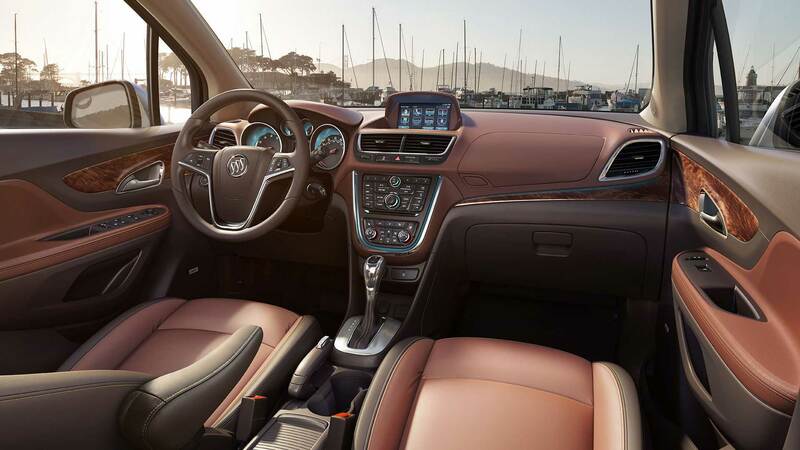 The interior of the Buick Encore. 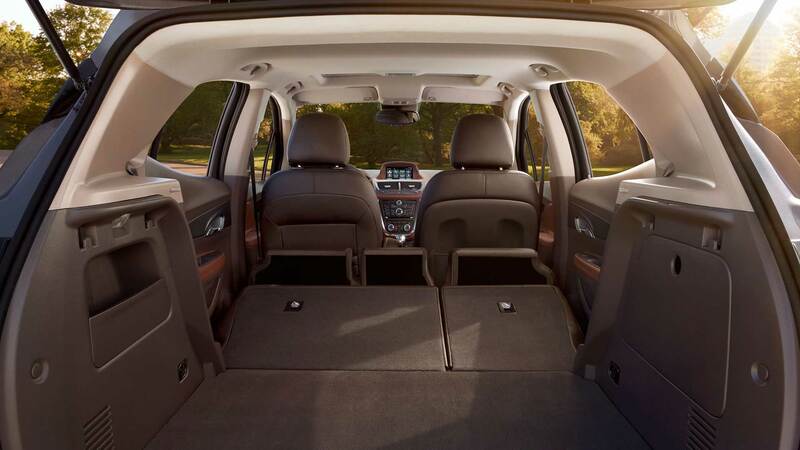 The seats fold flat and the front passenger seat also can fold nearly flat to accommodate longer cargo. The interior looks like it could hold lots of stuff. No review is complete without mention of infotainment. My iPhone synced easily with the Buick IntelliLink™ system. While the 7” touch-screen could be a bit bigger, it seemed easy to use and intuitive. I really didn’t go much further with it, but it’s far better than Cadillac’s annoying CUE system. 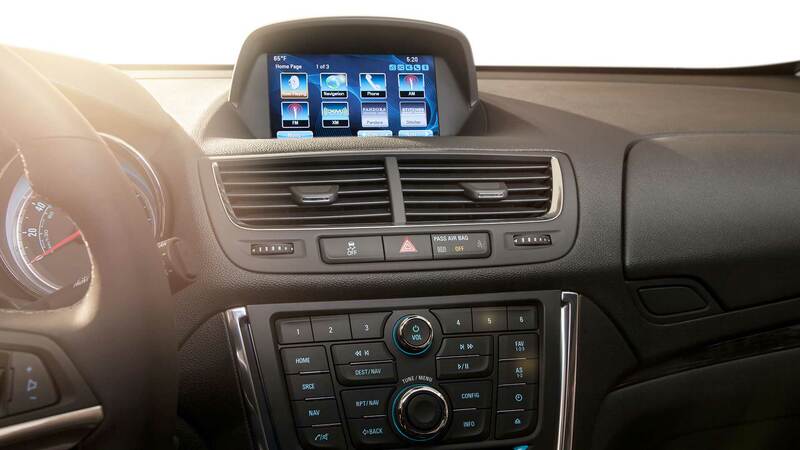 Buick Encore’s IntelliLink touch-screen Infotainment system. 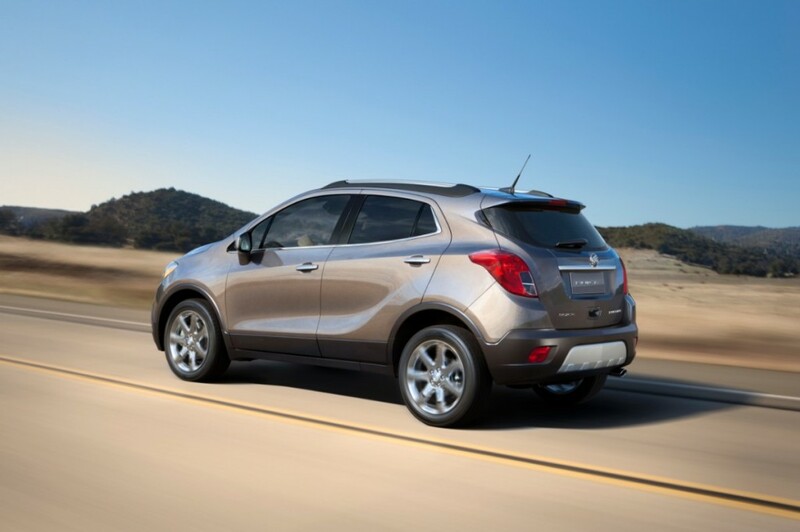 So the Buick Encore is really a niche lifestyle vehicle and GM had no idea how it would go over in the US market. The 2013 Encore went on sale in February and through August, it’s sold nearly 20,000 units – three to four times GM’s original estimates. Days in inventory is a gravity-defying 15 days (normal inventory sits around more than 60 days before it’s sold). And the average age of a Buick buyer has come down by 10 year in only 8 years – so younger buyers won’t feel out-of-place in a Buick dealership. I don’t know if I could ever own a Buick. I might still hold out for something like the long-rumored rear-drive Riviera flagship. But in the meantime, the Encore is the most tempting Buick I’ve driven in decades.